I find it's the little things that seem to have the bigger impact when it comes to anyone's ability to trade Forex any little better, and so today comes a shameless approach at heading in that general direction. So we'll start with this post and see where it leads. I wrote something in a recent post had me thinking about extending our old diagonal trendlines article, and adding one more crucial element to the list (in line with one of the concepts discussed within it), and that's the simple fact of ways to draw them “properly”. First off, there is no “proper” method. Lines are created based on heavy levels of confluence, nothing more and nothing less. But naturally, there are different ways to perceive them. Being aggressive in your analysis is crucial. If more people did this there would be a lot less horror stories out there. But people can be disorganized and sloppy – so c'est la vie. But for today's purposes, this means drawing trendlines to the point where your “edge” is simply a matter of whether or not you have done your homework and you have a heads up on what lies in the future. Not just in the Forex market, but with any market, this concept applies heavily, and is nothing new. There are several books that cover the topic, and once again, Tom Bulkowski's name enters the blog post. He has done a fair share of work on these in his books, and I'm just going to provide a rough brush stroke here of the concept itself, and major points I find with trading them. Most people draw inner trendlines without even thinking about it, and today, I want you to take that thought process a step further. 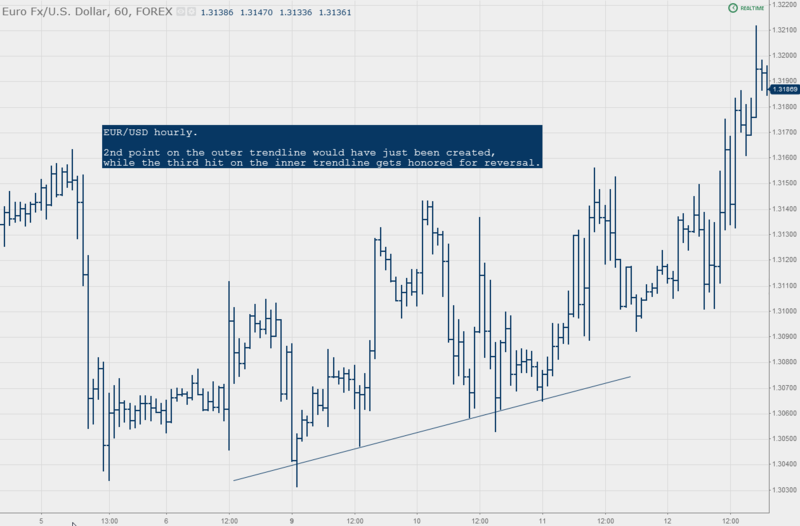 Everyone knows the outer trendline, and everyone is probably used to fanning them. But the inner trendline, particularly in this market, tends to hold a lot of weight while attracting less public attention. This market is very messy when it comes to order flow. The amount of liquidity turns “obvious” levels into sandtraps for amateurs that utterly lack patience. The earlier you can get in the market and make a move before price, of course, the better. When inner trendlines break, you typically get a lot less “messy” reaction to a backwards reaction vs. that of a more public one (not to mention executed in advance). The explanation for the reasons behind this is better left to opinion, which I won't waste any time discussing here. When it comes to drawing these, follow the cardinal rule of drawing any line on a chart that we have spoken about here from day one: look for heavy hits and confluence. So in essence, this concept is no different than that of drawing horizontal lines. If those heavy hits are coming from the outer trendline, so be it, but many times, they are coming from the inner. 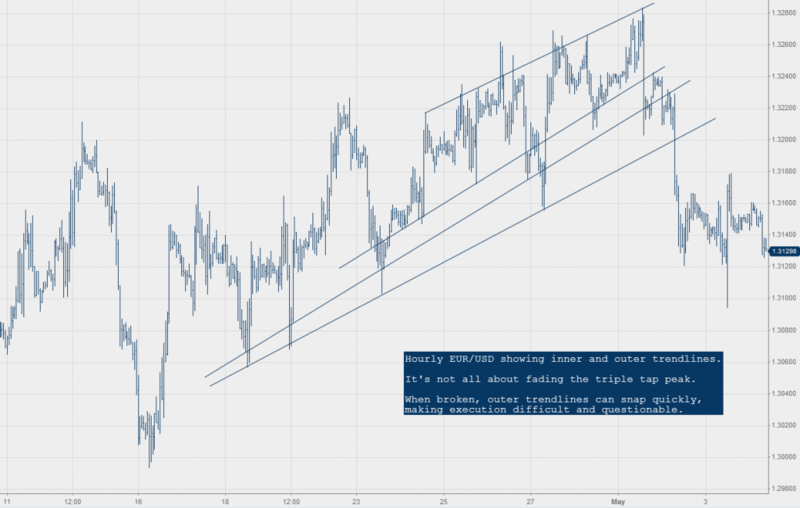 Reaching down and looking at smaller timeframes is oftentimes also required in order to draw these properly. Tom's performance metrics on the stock market showed them to be more effective than outer trendlines when used in certain contexts, and logically, it makes sense. In the case of a breakout, your performance will better if you're entering earlier. In the case of a fade, the logic isn't so clean (though he did not cover this): you'll get more opportunities presented in terms of trading them, but if your fade is done prematurely (price reached for the outer trendline or further), just the opposite occurs. But in terms of those fades, this market is notorious for using them all day long. I say that without flinching because I am so used to seeing buzzing reactions around them. If you're using them in conjunction with other entry strategies, then the awareness alone is well worth the consideration. And briefly, the rule “the bigger they are, the harder they fall” applies significantly here. The greater the touches, the greater the spacing between hits, the longer the trendline, the flatter the angle, the longer the movement once broken. This concept is of course no different than the ones that apply to our horizontal support and resistance lines discussed heavily on this site, and why they become a swarm of activity once approached. The charts below show some very basic examples, but the idea is clear. I could spend all day marking up charts with these (as I do), because they happen so often. Something for the consideration tank. Hi, this site doesn’t come with adjustable text but for the image, just click anywhere on it to expand. Once open, you can make it even larger by hitting the box in th upper right hand corner. Thanks for stopping by. first of all many thanks for the knowledge you are sharing with us. Unfortunately some of the links are not working, if you click them you get nothing (bad gateway, page not found etc.) Is there a possibility to see the charts you mention regarding inner trendlines? That would help a lot. You’re welcome Mert and many thanks. What browser are you using and where are you based? Everything is looking fine on my end. I am thinking it might have something to do with the content delivery network I use. Thank you!